Google chrome is the Popular and most used browser. Do you know why it is popular ? It is simpler, Faster and secure than other browsers. And You can customize it with Chrome Extensions and Apps. Like Google Pay For Android, Chrome Browser has Google Web store. The flood of extensions in Web store really made the huge difference in Chrome and put this in the first place in the browser war. Many Extensions are available to modify the Tab Page in Chrome. But the New Tab Page – chrome Extension is something special compare to other ones. 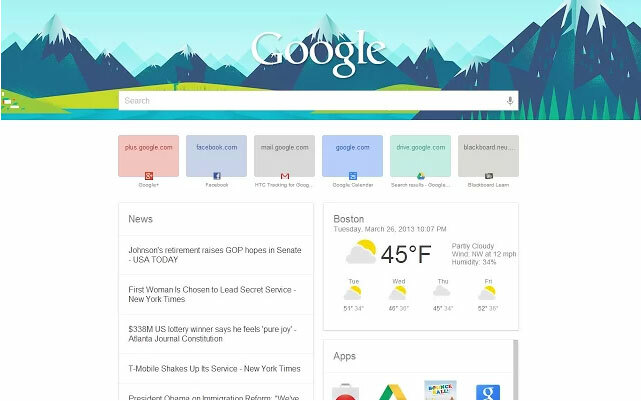 This New Tab Page Extension brings you the Google Now Style and looks in your Chrome Browser. You know that default new tab page in chrome will show you the most visited sites as a thumbnail and installed apps. This New Tab Page incorporates default features also, and show you the most visited sites and apps in a fresh and stylish look. Once installed this New Tab Page will open its Google Now Style new tab page whenever you click the Plus sign (new tab) in the chrome. There you can get your Most visited websites, Google News card, Weather Report and Apps. And, Of course, the big Google Search box with awesome background image. The search box has the web kit voice command feature, using that you make Google search using voice commands. You can easily get your favorite websites in the Most visited sites thumbnail column, by deleting the current thumbnail. The News card will bring you all the latest news from all around the world using Google News api. The Weather widget will show you the current temperature, Humidity, Wind Speed and upcoming days weather forecast. By default, the weather widget shows the Los Angeles Weather report, you can change it to your location by clicking the ‘Your current location’. Overall this New Tab page looks Good and useful.